Astoria is a city of 10,000 people on the Columbia River, just a few miles from the Pacific Ocean. Astoria is the oldest American settlement west of the Rockies. The city lines the south banks of the Columbia River, and the north banks of Young's bay. 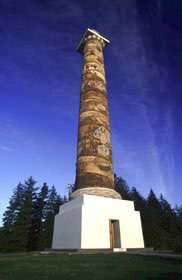 Surrounded by water and tall evergreen Douglas Fir, Hemlock and Spruce trees, Astoria, is rich in scenic beauty, with a vista of the Pacific Ocean and its endless miles of sandy beaches viewed from a top of Astoria's historic Column. 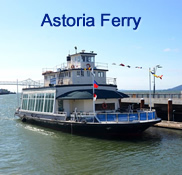 Discover why Astoria is a delightful romantic getaway. Visit Astoria's many cafe's and unique shops. 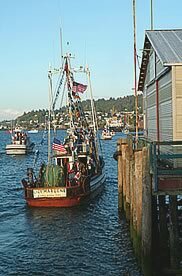 Tour nationally acclaimed Columbia River Maritime Museum Explore maritime history from dugout canoes to sail ships. Walk the bridge of a World War II warship, marvel at the 44-foot motor lifeboat plowing through a wave in a rescue mission. The Cannery Pier Hotel & Spa in Astoria, Oregon is a forty-six unit upscale boutique hotel, situated on a dock 600 feet into the Columbia River, offering unparalled views. 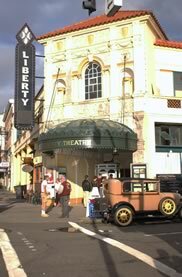 Experience a glimpse into Astoria's historic and bustling past. Open up the shutters and relax in your clawfoot tub while watching the amazing Columbia River ship trafic. The Atomic Motel offers a fun experience in a period furnished property at a great price... and with special "of the era" treats and surprises. If you want a stay in a place that is cool, hip, fresh, affordable, sparkling clean and super friendly, the Atomic is the right choice for you. We have the charming "Mom and Pop" couple living on site (Barbara and Dan - married for decades and still enjoying it! ), complimentary coffee, tea, fresh fruit and local Scandinavian pastries as well as pet-friendly rooms. Look Who's Talking About Us ! Icon vs. Icon - "'The Goonies' 30th Anniversary Celebration"
Smithsonian Magazine - "The 20 Best Small Towns to Visit in 2013"
Sunset Magazine - "25 best hotels in the West"
Budget Travel - "America's Coolest Small Town Nomination"
Travel & Leisure - "Driving: The Oregon Coast"
1859 Magazine - "Lodging Guide: Essential Information"